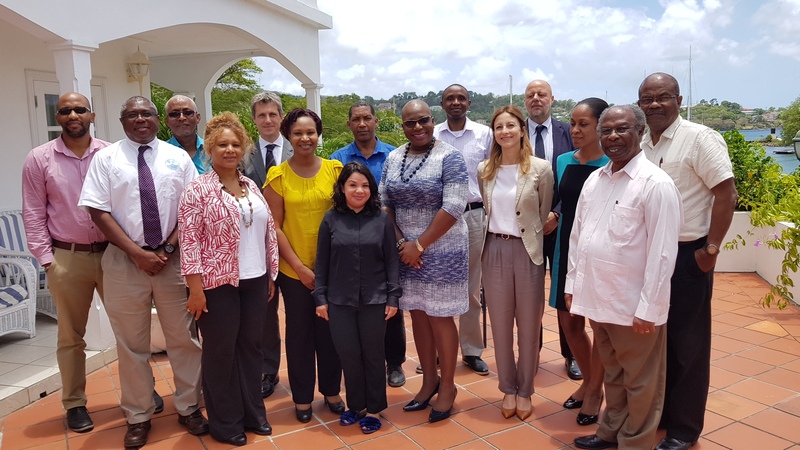 The Caribbean Community Climate Change Centre (CCCCC) and representatives from the Governments of Italy and Saint Lucia held a series of meetings this week, to discuss the development of an early warning system (EWS) for the island. The Project is being funded by the Government of Italy through its Ministry of Environment, Land and Sea. Using geographic information, the system is expected to forecast the potential effects of national disasters, provide flood mapping and other sector- relevant and necessary information to aid decision-making during events. As the primary stakeholder, the Government of Saint Lucia would be responsible for the operation and management of the system, thereby allowing the country to adequately prepare for major events and conduct comprehensive post-disaster assessments. Speaking at the meeting Minister of Education, Innovation, Gender Relations and Sustainable Development the Hon Dr. Gail Rigobert, emphasised the Government’s commitment to the initiative and reiterated the necessity of the system for development planning within the challenges presented by climate change. Ms. Emmanuela Vignola represented the Ministry’s Director General, Francesco de la Camera. Representatives from the National Emergency Management Office, Meteorology Department, Water and Hydrology and the Ministry of Budget and Planning represented the Government of Saint Lucia. The Centre was represented by its Executive Director, Dr. Kenrick Leslie, Ms. Sharon Lindo, Policy Adviser and Mr. Albert Jones, Instrumentation Specialist. The Caribbean Community Climate Change Centre (CCCCC) coordinates the region’s response to climate change. Officially opened in August 2005, the Centre is the key node for information on climate change issues and the region’s response to managing and adapting to climate change. We maintain the Caribbean’s most extensive repository of information and data on climate change specific to the region, which in part enables us to provide climate change-related policy advice and guidelines to CARICOM member states through the CARICOM Secretariat. In this role, the Centre is recognized by the United Nations Framework Convention on Climate Change, the United Nations Environment Programme, and other international agencies as the focal point for climate change issues in the Caribbean. The Centre is also a United Nations Institute for Training and Research recognised Centre of Excellence, one of an elite few. Learn more about how we’re working to make the Caribbean more climate resilient by perusing The Implementation Plan. By caribbeanclimate in News on May 11, 2018 .